At one time or another, most people have concerns about halitosis, also know as the dreaded "bad breath." Whether it's meeting new people or an intimate relationship, our breath can be a big turn-off if we're not careful. It's often easy for us to ignore but make no mistake, although we can't smell our own breath, others are bound to -- sooner or later. So how do you know if your breath is less than pleasant, or downright appalling? Without actually being told, you can't be certain. The common methods used are to blow into your cupped hands and smell quickly, floss your teeth and smell the floss afterwards or lick the top of your hand and take a whiff. These ways may give you a general idea but they won't be very accurate. If you have no medical problems, the best approach to bad breath is prevention and use of natural home remedies to mask anything you've failed stop. The path to cleaner, fresher breath depends on the source. Widespread causes of halitosis are residing right there in your mouth. Plaque is a film of odor-producing bacteria that forms on your gums, teeth and tongue. Poor dental hygiene can result in tooth decay and gum disease. Foods with strong odors such as garlic, onions and spices are absorbed into your body and exhaled out of your lungs. Acidic foods and beverages can promote sour breath. Coffee and fruit juice can also cause an undesirable smell. Tobacco and excessive alcohol are not only detrimental to your health, they will wreak havoc on your breath and leave a bad taste in your mouth. There may be an underlying health problem such as a stomach, intestinal or bowel infection that may cause less-than-favorable breath. Sinus and throat infections are common and often cause a bad odor. More serious illnesses and the medications prescribed to treat them can also be a factor. If you suspect any illness, see your doctor. Treating a disease or disorder is important in itself and will help cure the chronic bad breath that goes along with it. Practice good oral hygiene and keep everything in your mouth as clean as possible. 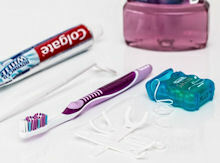 Brush and floss your teeth twice a day to get rid of plaque and food between your teeth. Use baking soda toothpaste or household baking soda to freshen up. Do you see a white film on your tongue? Brush that off frequently, to reduce the bacteria residing there. Try to reach as far back as possible without gagging. A tongue-scraper is handy, which can usually be found by the toothpaste in stores. Follow up with an antiseptic mouthwash to kill germs and give your breath a boost. Saliva naturally cleans your mouth and combats dryness. Some people habitually breathe through their mouth or sleep with it open. This dries everything up and allows bacteria flourish, giving you unwelcome daytime or "morning breath." Drink some water, particularly after you've finished eating and keep some on your nightstand at home for a quick drink. In the day hours, chew on some sugarless gum or candy to keep the saliva flowing and enhance your breath. Another preventive measure is to watch your diet. Eliminate spicy and acidic foods. If you have stomach cramping, gas, bloating or diarrhea, reduce or cut out dairy products to see if you are lactose intolerant. If you discover that you are, there are OTC (over-the-counter) pills you can take or drops you can add to your food to aid digestion. Calcium supplements are strongly recommended to replace what you're missing. Go natural! Parsley is rich in chlorophyll, which freshens breath. When eating out, chew on some after your meal to temporarily refresh your breath. On a sour note, If you take garlic, whether natural or in the form of pills, your body will absorb it and you'll be exhaling it! OTC remedies include gum, mints, sprays and mint strips. These all are great for a quick-fix to mask bad breath, but they don't cure it. The best solution is to find out what is causing it and take appropriate steps to alleviate it.